Overall PR count still remaining low for week two, looks like the press are taking a while to warm up after the festive break! Staying in the number one spot for another week is Fortnite with a lot of coverage around eSports and plenty of mentions in articles about battle royale modes coming to Stardew Valley and Red Dead Redemption 2, in which Fortnite is referenced. Making its debut at number two and knocking Red Dead Redemption 2 down one place is Metro Exodus, thanks to a story trailer drop which makes up 29.5% of the coverage and details of bundles and special editions taking up 23.5%. Will it be able to maintain the momentum over the coming weeks to keep it in the top 10 until launch on the 15th February? Game play modes, plus chart and sales talk put Red Dead Redemption 2 in third position. Another new entry, Resident Evil 2 the HD remake comes in at number four with a huge 49.8% of all its PR coverage for the week talking about the newly released demo, with lots of sites also sharing gameplay videos of the demo. Technical specs is the top subject of choice for 28% of Battlefield V press coverage thanks to mentions in several announcements at CES for new video cards, graphics cards and GPUs. The revelation that Tom Clancy’s: The Division 2 would not be available on Steam but would instead be found on the Epic Games Store pushed the title into sixth with 32% of articles covering this story. It’s interesting to see this product in the top 10 when it’s still eight weeks away from launch. Overwatch remains in seventh place for a second week running, again mostly down to coverage of its eSports. Surprisingly and very interestingly position eight goes to another title making its debut, but what makes this particularly noteworthy is that this product is a mobile game. Coming to iOS and Android, Alien: Blackout was officially announced and along with coverage of the announcement details there was lots of speculation around if it would eventually come to other formats and also if it could possibly be a sequel to Alien Isolation. We’re all curious to see if it will appear on the list again next week! Lots of coverage on chart position and sell-through information puts Call of Duty: Black Ops IIII at ninth. 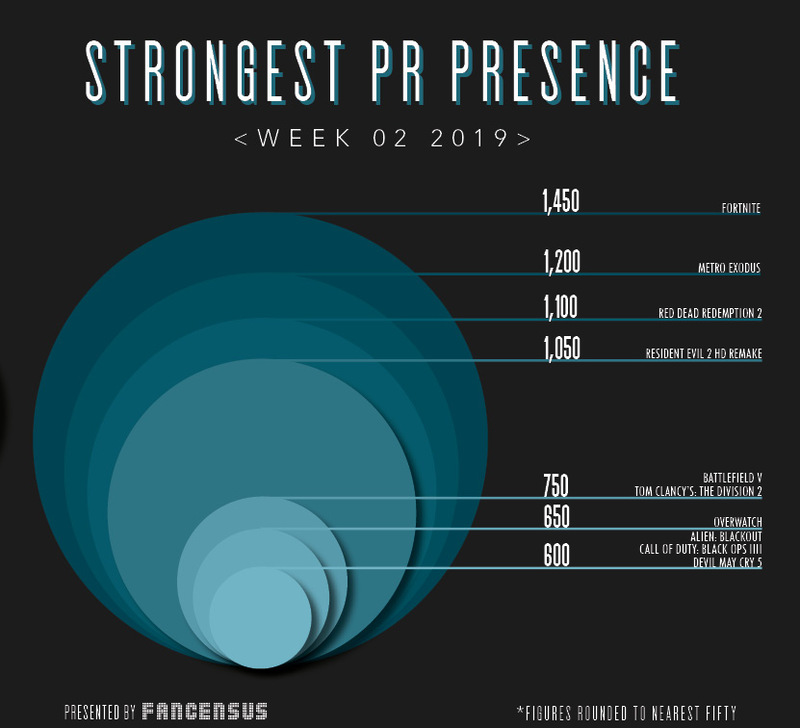 Finally bringing up the rear in tenth is Devil May Cry 5 with 34.4% of its PR articles covering the announcement of a demo coming next month. Week 2 saw Super Smash Bros. Ultimate, Kingdom Hearts III, Fallout 76, Monster Hunter World and Fifa 19 all drop out of the top 10. This is the first week Fallout 76 has not made an appearance since its launch on 14th November last year.